If you are a young child's parent, you need an auto that can easily accept their car seat. When you visit Sheehy Volkswagen of Springfield, we can advise you about models on our lot that have the most user-friendly LATCH hardware. Let's look closer at LATCH evaluations. Children's car seats make kids safer while riding in automobiles, but only if properly installed. Short for Lower Anchors and Tethers for Children, the LATCH system assists parents with car seat installation. It provides hardware that make proper installation more likely. The Insurance Institute for Highway Safety set LATCH hardware criteria in 2015. When auto manufacturers release new or updated models, this institute evaluates the vehicle's LATCH system against the hardware criteria. 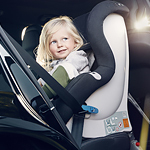 Model's that meet or exceed the list's standards let parents more easily install child restraints. The IIHS assigns two ratings, which are Good and Good Plus, and the latter enables the easiest secure installation.